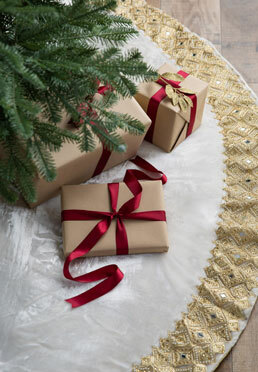 Inspired by the legacy of Biltmore, our beaded Christmas tree skirt lends timeless elegance to your décor. This Balsam Hill exclusive features embellished appliqués, beads, and faux gems that sparkle against the plush white fabric. To perfectly complement your tree, we recommend that the diameter of the tree skirt be at least 6" more than the full width of the tree.